The July 2007 report and the introduction to the March 2007 proposals make interesting reading as a pair. Although the “crisis” came to light only this week with proposals such as closing the Sheppard Subway, the TTC has been thinking about this for a while. Indeed, in March, they had a $100-million list of cuts ready to go if the City felt particularly stingy about its annual subsidy. The July report states that TTC management “are hopeful of being on budget for 2007” despite the currently projected year-end deficit. In other words, contrary to the information debated barely a week ago at the regular TTC meeting, the projection now is for a balanced budget. What caused the change? The TTC had budgetted a reserve to allow for the possibility that they would be ordered to pay the employees’ health care premiums. Following the court decision in favour of the ATU, the benefit was extended only to union members who were covered by the ruling. The remaining reserve for non-union staff, about $4-million, is no longer needed and the projected deficit is reduced accordingly. Why this option wasn’t reported at the last meeting I don’t know. This would have rendered moot all of the talk about how we were losing so much money by Metropass users not pulling their weight with riding going up and average fares going down. The options before the Commission are shown along with some of the details behind the numbers. Savings in 2007 are slim because the staff to operate the additional service have, for the most part, already been hired and will have to be paid. A hiring freeze and attrition can absorb them into the workforce for a reduced scale of operation, and we may also save on overtime because we will, for a time, have surplus operators paid straight time for work normally done on an overtime basis. Three options for fare increases are detailed along with three possible implementation dates. We have already passed the line for a September fare hike, and the earliest we could see one is now November 1. This reduces the available revenue in 2007 to the low end of the projected ranges. The full year values shown for 2008 do not allow for riding lost through higher fares. How many riders we lose will also be affected by how much service we add or cut, and it is impossible to estimate either effect in isolation. Although this information will form part of the September 12 update to the Commission from staff, it should be worked out as soon as possible and be available in the public feedback sessions planned for the coming weeks. 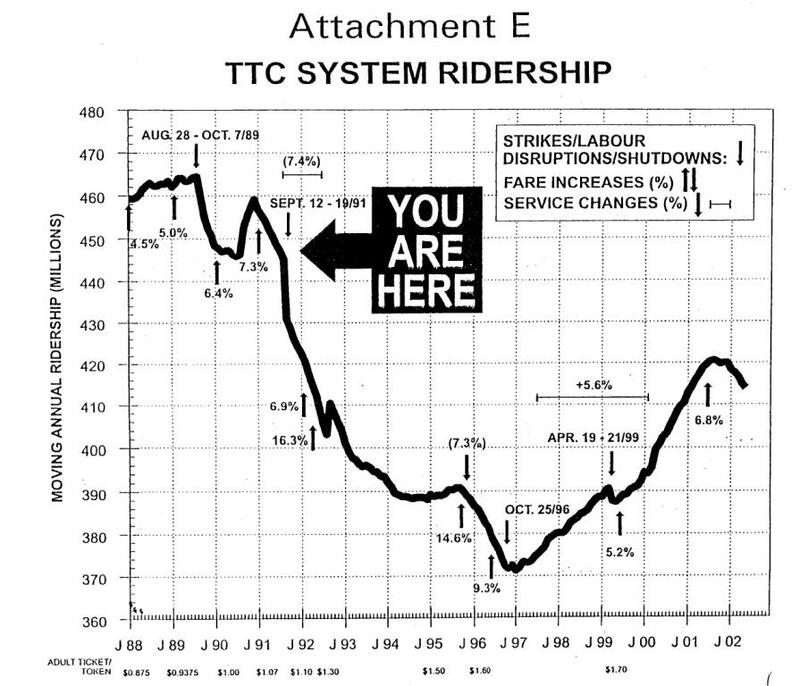 These texts and charts tell us what the TTC was already contemplating back in March 2007 during the budget debates. The list of options (included in the “Budget Cut Options Reports” above) contains some options that were dropped for the July proposal. Why do these not surprise me? TTC management has been trying to kill off night service for years, and their antipathy to anything beyond the most basic of passes is well-known. Fortunately, they had the good sense to leave these off of the July list when there are other cuts that produce far greater savings if that’s the route the TTC must take. It is worth noting that the list here is much longer than 21 routes. The common statements by the TTC about 21 routes are misleading. The “Candidate Routes for Elimination” is a map showing all of the routes in question, and clearly this has all three sets of routes on it, not just the basic 21. 503 Kingston Road Tripper: This route always does poorly in the rankings because it runs only in the peak period and its riding is unidirectional with cars running nearly empty in the off-peak direction. In practice, this route is part of 502, 501 and 504, and if it is eliminated, service on those routes will have to be increased, especially on the 502. The way that 502/503 is operated leaves a great deal to be desired and has contributed to falling ridership on both routes for many years. 85 Sheppard East from Yonge to Don Mills: This is the “replacement” surface bus for people who need to access stops between the subway stations. Earth to TTC: When you open a subway with widely-spaced stops, this sort of bus route is part of the cost of doing business. 22 Coxwell to Kingston Road on weekend evenings: We might as well abandon service on Kingston Road completely! The daytime 502 runs every 20 minutes, when it gets past Woodbine Loop, and with this proposal, the 22 would only run on weekday evenings. An object lesson in killing off riding and then complaining about unprofitable service. Also in the March Options we have Attachment B listing routes that received off-peak service improvements as part of the Ridership Growth Strategy in recent years. These would be rolled back as part of the July 2007 package. The map is in “Routes With Offpeak Improvements”. The scope of the proposed changes is bigger than what the TTC has presented. Indeed, the projected impact of the additional cuts would be to eliminate 15 routes completely, eliminate parts of 45 routes, and eliminate service during some time periods on 85 routes. This would affect nearly 78-million trips (roughly 1/6 of all trips taken on the TTC), and nearly 11-million trips would be lost. Note: Past estimates by the TTC of riding loss have assumed very low attrition rates on the assumption that riders will move to other routes. This probably indicates that many existing services are so poor that they have a disproportionately high number of riders who have no choice but to use the TTC, somehow. 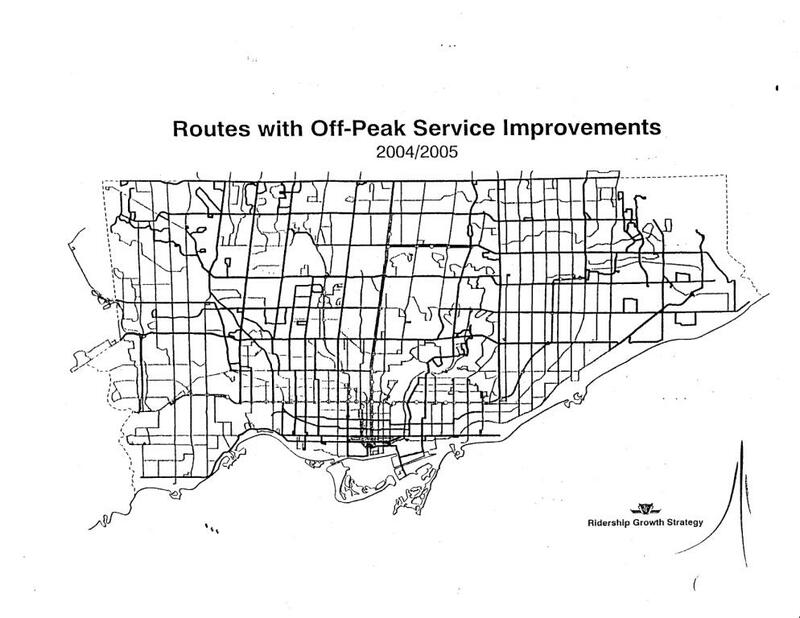 The March Options also lists the many routes where peak service improvements were planned for fall 2007. These have been deferred, and the earliest we can hope to see them is early in 2008 if Council and the TTC come to their senses in the fall. There is no ridership estimate for the improved services. 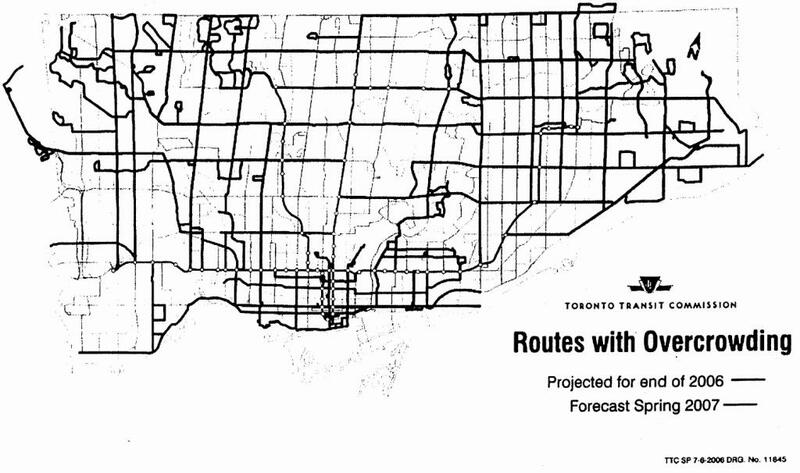 The map of “Over Capacity Routes” was expected to be almost completely addressed by the 2007 improvements and the TTC, for once, would have caught up with riding on most lines. Since there are few surplus streetcars, major improvements on those lines are impossible at present. Finally, the “Ridership History” chart shows the huge loss of riding through the 1990s along with the legend “You Are Here” demonstrating that we have climbed back to pre-recession, pre-Harris riding levels. All of this is threatened by the budget cuts. What galls me particularly is that this material should have been on every Councillor’s desk during the tax debates and should have been in every newspaper. We heard from every shill the real estate industry could come by on the horrors of Land Transfer Tax, but we didn’t hear the alternatives. The public consultation meetings in each ward need a very simple prop: A map showing which routes would be cut, which won’t be improved, and the ward boundaries. It would be unseemly for staff to provide a list of which Councillors voted against the new taxes, but that’s not hard to find. 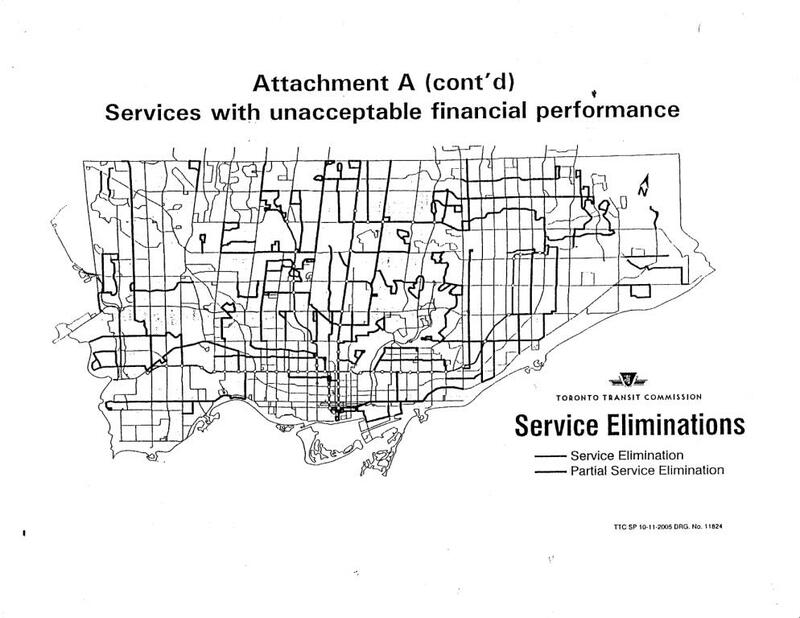 Tomorrow, I will turn to the question of the “Poor Performing Routes” and the mysterious absence from those lists of routes whose financial performance, according to the TTC’s own reports, are much worse than those on the chopping block. This is terrible news for the TTC and Toronto itself. I hope that the MoveOntario 2020 plan still goes ahead as planned seeing that this is Provincial monies at the moment and hopefully the Federal government chips in their third when they resume after the summer break. I feel that the MoveOntario 2020 plan was the most progressive transit plan that would be good for Toronto and Ontario on so many fronts, the environment, the economy etc… I hope that we don’t turn our backs on this plan because of this bump in the road. If Sorbara’s pet subway cannot be operated, do you think he’ll throw in subsidies for operation then? How much does it cost to maintain a “shrink-wrapped” Spadina extension? I hate lobbying against subway extensions (because some extensions are needed, and because certainly higher order transit is) but given that this has now come to pass someone should put together an easy to read chart demonstrating how one additional kilometer of subway= X additional hours of bus/subway service. And then someone should compare the annual ridership of what $660 million committed provincial and federal dollars are buying and what it should buy. The number I’d be fascinated to see for the Spadina extension would be a cost comparison of operating it as a subway vs. as LRT. Though I’m not at all optimistic on convincing the province and the feds, if the costs are similar to the Sheppard subway it’s worth a try. Yes, the subway EA would go down as wasted money, but that wouldn’t be the first time, and if the operating costs for a subway are that much higher that money would be recouped fairly quickly. Plus, since light rail would be cheaper to build, this could also free up some money sitting in the construction trust fund that the province could use to help out the TTC in other areas without affecting their own bottom line. Or you could mix and match and add 50 new LRT’s to handle overcrowding on King/Queen and other 500 routes, so a streetcar is always in sight… with 947 low-floor hybrid buses… a 25% increase in the streetcar fleet and a 50%+ increase in the bus fleet (depending on scheduled retirements of GM New Looks, et al). You don’t have to be a financial whizz to understand these capital trade-offs, it just takes simple arithmetic and a little common sense to realize that saddling the TTC with an underperforming subway or RT or… is no bargain as it saps the TTC’s ability to allocate service to demand… where riders want to ride… rather than to where the politician’s ridings and votes are. It’s a gift that keeps hurting transit for decades! The YorkU/VCC subway is budgeted around $2.0B… more than twice the cost of Sheppard’s subway. It would have been much wiser to extend YUS from Finch to Steeles as the first subway expansion… and then YUS from Downsview to Steeles–only as you’d get a much bigger ridership bang for the same or fewer capital dollars (York Region’s EA predicts 3,000 peak hour subway trips south in to York U… on a mode with a 30,000/hour capacity.) QED! Looking at the figure showing ridership over the years, with fare increases and service cuts, it’s clear that ridership is much more sensitive to service cuts than fare increases. Heck, since the mid-1990’s it doesn’t show any sensitivity to fare increases – and although not up to date, we seem to now have even higher ridership with higher fares. I’d say the answer is that if this needs to be done, the primary answer is raise fares, both to avoid this cut, and to deal with the lack of service to cover the existing demand (even if all this is done, there will still likely be overcrowding on some routes. And start off with a $15 increase to the metropass to counter-balance the $15 savings everyone is now getting from the tax credit … so that a 25¢ increase corresponds to a $27.50 increase to the metropass, not just a $12.50 increase (i.e a $127.25 pass … though simply $125 might make everyone’s life easier). Sounds expensive, but after the tax credit it’s less than $106, so still isn’t that much more than was being paid a couple of years ago. 107 Keele shouldn’t be running – replace by a couple of short industrial loops into downsview? Instead of killing the 115 Silver Hills, how running it into Leslie Station instead of York Mills. This would let you run the existing 20 minute service interval with 1 bus instead of 2, maintain most, if not all of the existing passengers, and not have the bus spend most of it’s time stuck on York Mills Road. (not on the list to be cut is the 122 Graydon Hall bus – the same could be done to this, as it only is performing marginally better than the 115). There does seem to be a lot of service down Finch and York Mills that duplicates the Sheppard Subway – now I guess these services are necessary if the subway actually does close, but I’d wager that will never actually happen, at least during weekday peak. Kill Kingston Road service? Another higher order transit corridor on the official city plan – though how that happened I don’t know (perhaps the city planner lives in Oshawa, takes the Go Train, and has never driven Kingston Road between Danforth Avenue and Eastern Avenue! :-). Odd that one figure shows Kingston Road should be cut, and another shows it with overcrowding. This corridor does seem viable for transit service somehow There must be a way to provide a cheap, decent, reliable service on this route that would get used. Is the service agreement with York really not costing TTC money? Is there any money to be saved if this was eliminated? How money buses wouldn’t be needed? Instead of having 100 less buses from the elimination of the non-opening of the Mount Dennis garage, could these buses be kept, and pulled from York Region routes (after the contract expires)? I.e. if it costs $7 million a year to house the additional 100 buses, how much does it cost to house the current buses for York Region, and is this included in the cost that York Region is billed. Steve: York Region is billed the fully allocated costs of the bus operations handled by the TTC on their behalf. However, this does not include the capital cost of the vehicles or garages. Thanks for spending the time to make all this information available Steve!! I sure hope that they reconsider the 30 Lambton, my goodness most mornings and thru the day with us only having 30 minute headways, the buses are more than 60% loaded, usually out of 42 seats (NFI D40LF) 25 are filled. I will admit that after 10pm 30 Lambton becomes 1 hour service, and yes, it is fairly underused, Saturdays are actually quite busy on 30 Lambton the morning and afternoon espicially, evenings after around 7 it does get underused, after 10pm (service drops to 1x hour the bus is EMPTY mostly. Sunday Service is 30 mins daytime 1 hour after 7pm. Decent loads till around 6pm, then it dies. Most riders on this route ride (Eastbound) from Kipling Station till around Scarlett, (westbound) the bus usually empties out around Jane. The most intense area of use is the Maybelle Community there are a lot of Disabled/Senior/newcomers in this areas, partially due to the fact that there is a dense area of Low Income/ subsidized housing in this area. There is also a LOT of Blind / Visually impaired residents in this little area, as it is the home area of BALANCE (balancetoronto.org) and its clients. I for one Totally rely on this route as both subway stations are almost inaccessible for the disabled, for one the walking Route to BOTH Islington and Kipling Subway stations are dangerous for blind / Visually Impaired, much less the disabled Senior population. Another problem is the 50 Burnhamthorpe is NOT and accessible route and stops running at at 10:15pm, 7 days a week. This is crazy — expanding the system, buying new streetcars, subways, and then hearing cuts like this. The gov’t needs to change the way capital and operational budgets are managed. There should never be an operational defecit if money for capital expansion is there. How can we spend $$$ to pretty up Pape station and not have money to run the Sheppard line? This is just beyond stupid. There should be one budget. AFTER all operational requirements are met, the leftover goes into the capital budget. I know this sounds ignorant, but it’s common sense. What the City is doing would be like “me” spending zillions renovating my house with granite and marble floors, and then not having enough money to pay my phone bill. It galls me too, Steve. We may have different approaches to fix it, but it’s saddening to see how far this city has fallen in just a decade. Councillors should indeed have had these details on their desks Steve, but if there was word of how deep the cuts would be then they might have asked awkward questions like how Shirley Hoy and Joe Pennachetti apportioned those cuts, how TTC ended up with $100m and whether TTC was being scapegoated even given its position in discretionary spending terms. As an aside, you mention elsewhere in a comment reply (Much Ado…) that the City would have had 2007 revenue from the land transfer tax. This is *not true* Steve and the question of how the 2007 hole was to be filled is still unanswered. It was made clear that there is a lead time of several months from vote to implementation and that was why it was claimed a January 1 deadline could not be met if approved in October. Steve: My understanding was that the LTT was to be effective retroactively to the date the tax was passed by Council or shortly thereafter. This needs further investigation. Steve… I am been on your website lately and have read the comments posted by readers who are worried about the act that would be performed to meet the crisis..
Is this our fate that we would have to face as a result of politics and pay the price of it? You have been a [Jane Jacobs] award Winner and an activist…. Is there nothing that can be done to stop these cuts … the whole idea itself is scary and will it become reality? There are so many of us who live on the Ssheppard line and make it to work and have our families to take care of? Who have invested in properties in that area and moving out is next to impossible? Don’t we deserve to live a good life and try to give the best to our children? I am a single mother to two children and this cuts effect me? Is there a ray of light some where down this dark tunnel? Steve: I think that both sides of Council are finding out that the last week’s events have riled people at a far deeper level than they anticipated. Personally I doubt that the Sheppard line will close, and I hope that by early next year we will have the deferred service improvements in place. That may be wishful thinking, but Mayor Miller and his supporters have to start talking about this situation in a positive way — here is what we can do in our city with additional revenue — rather than the doom and gloom of some Councillors, including TTC Vice Chair Mihevc who sound as if this huge cutback in transit is irreversible. The coming round of public consultation must be used to build support to retain and improve TTC services. The gov’t needs to change the way capital and operational budgets are managed. Part of this is due to the fact that municipalities legally cannot maintain operating deficits, but they _are_ allowed to borrow for capital projects. This is the result of accounting law, which encourages borrowing when you are making a material gain to your abode or place of business. Ideally, what you are borrowing for will result in a return on an investment that will pay off your borrowing costs. On the other hand, bankers tend to take a dim view of you trying to obtain a mortgage in order to put groceries on the table. The situation is not quite analogous to being able to borrow to renovate your home with marble floors while you are unable to buy milk. Rather, it is akin to getting a mortgage to either obtain a home or fix the roof, and then running into a short term cash flow problem that leads you to eating beans on toast for a year. Plenty of businesses do this. What’s odd is that provincial and federal governments are able to borrow to pay for the groceries, banking on nothing more than better days ahead. Mind you, it sometimes works for them. Believe it or not, Toronto _is_ being run like a business. But perhaps it should be run like a provincial government. Thanks for providing this information and for your in-depth report, Steve. It’s only too bad that it takes someone like yourself to make it available. I would think that the list of potential cuts, and the associated maps, would be a useful PR tool and should be more widely distributed. A review of the attachments seems to suggest that virtually every surface route in the city would be impacted through the potential cuts. The lower-performing routes would be cut at some times or eliminated entirely, but even the busiest routes would be impacted by eliminating service improvements planned for the fall. I would think these lists and maps should be being widely distributed if the TTC and City want to build support amongst the public — it cuts closer to home to see what riders will be losing, even if you’re not on a route with potential to be totally cut. And, in fact, the impact extends beyond just those two categories. As an example, one of my regular routes is the 24A, which is absolutely jam-packed in the morning between people going to work and high school students on the way to school. The 24 Vic Park already needs a morning service increase to deal with crowding issues; if the 67 Pharmacy is eliminated, there’s another batch of students that would need to switch to the 24, but no room for them. So not only do current 24 riders not get a reprieve from crowding, but a guarantee that it will get worse. Kingston Road isn’t the only route that is on both the “overcrowding” service-increasing list and the “underperforming” route-cutting list — so is the 139 Finch East express. I suspect there could be others as well. One minor beef I do have with the overcrowding map is that it’s painted with too broad a brush. It would be helpful to have a better idea of the extent of overcrowding, both in terms of time of day and extent of route. For example, the 58 Malton is shown as overcrowded, including all branches. Is the entire route overcrowded all the way to Westwood Mall in Mississauga? Or are conditions actually OK west of the airport… or west of Scarlett Road, etc. It’s arguable that this level of detail would be getting too far into the weeds and that the basic principles would not change, but I would still find it useful to get a little more context into the magnitude of the overcrowding problem. Finally, as a side note, a variation on the ridership chart is available in colour (minus the “You Are Here” arrow and service changes) in the Ridership Growth Study main report, which I find makes it easier to distinguish between fare increases and service changes. Steve: The full RGS report has the chart in question on page 34. New infrastructure is worthless if it can’t be operated. We don’t need an Egyptian theme in a subway station – we need fuel and a driver in a bus!!! Quite frankly the “World’s Longest Public Bathroom” suits me just fine thank-you very much. It’s an awful good thing I don’t swear because right about now I’m ready for a ‘blue streak’… and not one that ends in “22”!!! When you can’t even count on the environmental activists on Council to do the right thing I really don’t know what’s left for us to do. I’m sick and tired of the media playing along with the phony fear-mongering and forcing the public to also as a result! When I finally break down and scream in frustration they’re going to have to replace far more passenger windows than scratchity ever fouled up!!! As you say Steve, the councillors should have got this report before voting on the tax deferral. When I wrote my councillor to complain about how the vote went and asking why she voted against it, she said he was surprised, and concerned that one bus that serves her ward was on the chopping block (one of the three mentioned in the media before Friday’s meeting). She told me that she thought it would be best to wait for the province, even though I disagree with that. I agree that council voting against the taxes was wrong and each needs to be brought to account. That said, I’ve been hearing different arguements that council either fully knew the consequences or didn’t understand the full ramifications of the votes. Unless you read the Star or maybe the Globe closely (the Sun was all anti-tax drivel), residents probably didn’t realize how important the vote and issues were. So I’m inclined to believe the truth is somewhere in the middle, and why some soft left-leaning councillors like Perruzza and Ashton voted for the deferral. As Brent stated above, combining a lack of service improvements on the 24 Victoria Park with the removal of the 67 Pharmacy would be just about the dumbest thing ever. My friend lives right next to St. Clair and Pharmacy, and she takes the bus to her school near Lawrence and Pharmacy every morning. The buses on the Pharmacy are PACKED with students headed for her school, to the point where it’s standing room only most of the time. Closing the 67 Pharmacy would force all of them onto the Vic Park. Imagine the current crowding. Now shove an entire bus-full of rowdy students onto every one of the present buses. Do they want people to start driving or something? Steve is there any word on the 38 Highland Creek route? Viewing your map this route is on the chopping block and it is very busy with U of T Scarborough students. You can’t allocate them on the 95 or 116 it is at the limit at is. The Pharmacy Bus is packed as well, how is this under performing? Excuse me while I take some Advil for this headache. Steve: According to the list of proposed cuts, only the section east of UofT would be cut. Is the Spadina extension to the York U is going foward? I really want the subway to go through. I want it to start construction soon. Steve: Yes. Detailed design is in progress, and some utility relocation work will begin later this year.